No design skills required. Your signatures will look as beautiful as our examples with little effort required. 20 easy to customize templates included. Whether you’re a solo business owner, hairdresser, real estate agent or dog walker, anyone can create and install an amazing signature! Over 100,000 users trust us to help them create, host and manage their email signatures online. Install signatures using an API key and our installer software and any changes you make from your Dashboard automatically update your signature in your email client. Create your email signatures with our live preview editor. Make changes and edits on screen. Create and manage all your email signatures from your online dashboard. Edit, Duplicate, Download HTML, Email HTML, Email Keys and Search all your email signatures. Easily upload, crop, circle-crop and resize your images, logos and banners with inbuilt tools. Support for retina images and animated gifs too. Bring your email signatures to life by uploading your favorite animated gifs. 20 professionally designed, coded and tested HTML email signature templates included in our software. Over 200,000 social media icons to choose from, 90 networks, 30 colors, 8 styles & 11 sizes. Copy/duplicate any existing email signature right from your online dashboard. Email all signature HTML files or Signature Keys instantaneously to all employees with just the press of a button. Download all signature HTML files in a handy zip file for storing on your local hard drive. Add green messages like "Think before you print" and "Save a tree, don't hit print". Our HTML email signature templates are UTF-8 character encoded. This means you can include characters and letters from over 60 languages. Add legal and privacy disclaimers and/or link to your online disclaimers. Our software generates vcards for your employees automatically, just add a vcard icon. Easily upload and add your own custom icons and buttons to your email signatures. We host your images, vcards and assets on quality Amazon S3 servers with a CDN option. Track and report clicks to your website from your email signature using Google Analtyics. Promote sales, events, ebooks and products using banners on your email signatures. Change icons for holidays, we have Ghosts, Bats, Pumpkins, Trees, Stars, Baubles or Snowflakes. Turn on Affiliate Links in your email signature settings to add a small link to the bottom of your email signature. Sit back, relax and let your email signature make you money. Earn a 40% commission on any sales you send our way. 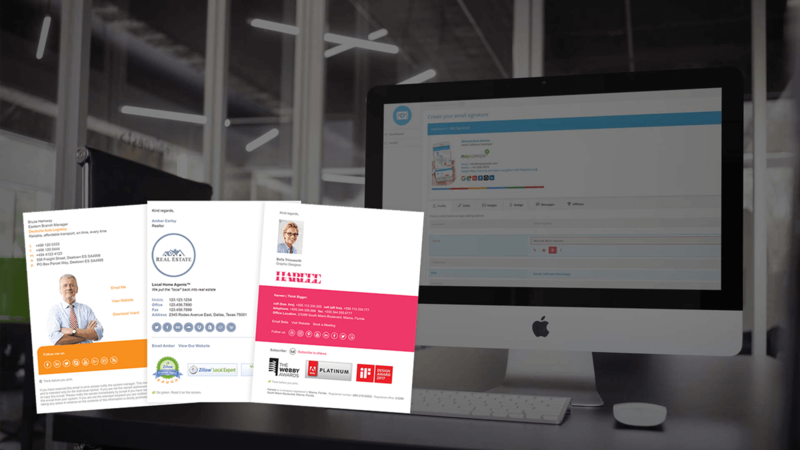 For Designers, Agencies and Marketers that want to create professionally designed, tested and coded HTML email signatures for their own clients, without the hassle of doing it alone. Access our support articles, up to date installation guides & create email support tickets.